Couples wanting a quiet holiday in a superbly private boutique resort which doesn’t cater for children under sixteen will be ideally suited to this well located property…. You have found your holiday destination . Shantara Resort Port Douglas is a contemporary small boutique, resort-style complex offering up-market self-contained apartment accommodation with personalised service in a friendly and relaxed environment. Located 400 metres to Port Douglas’ famous Four Mile Beach with its palm fringed beach, relax or swim in the warm calm waters. Take a stroll to Macrossan Street (400metres) that offers an array of trendy gourmet restaurants, cafes and boutique shopping to suit all tastes. 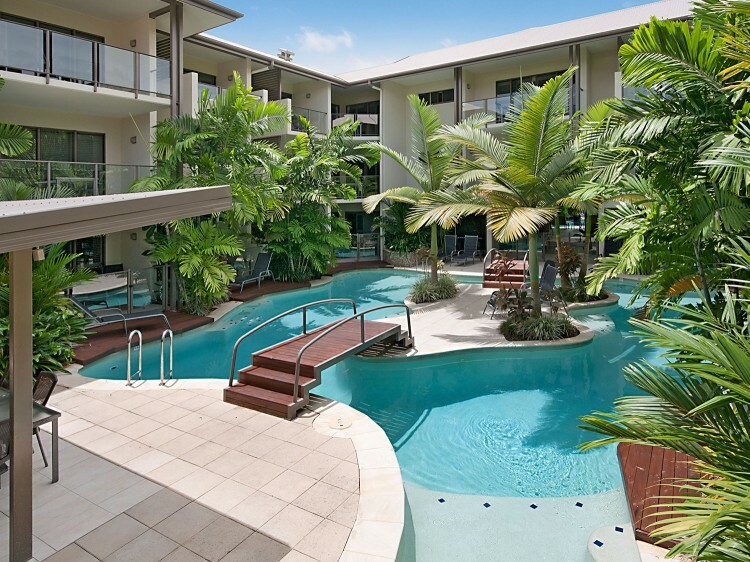 The open tropical-styled three storey complex features classical North Queensland architecture and offers your choice of spacious studio rooms or large comfortable one bedroom self-contained apartments, with either an outdoor Jacuzzi (hot tub) or direct pool access. Shantara welcomes teenagers over the age of 16 years. Ideal for the short stay, studios are well appointed with a king bed, kitchenette with tea/coffee facilities, bar sized fridge and microwave oven. Pool Deck rooms have an extra area outdoors with access to the pool directly from your balcony area. Open-plan living, dining and kitchen areas with all the modern conveniences. The bedroom is separated from the living area by sliding Japanese screens, and the bathroom has a spa bath tub and a separate shower recess. Glass sliding doors open to the large and comfortably furnished balcony. Pool Deck rooms have an extra area outdoors with access to the pool directly from your balcony area. Only four of these special apartments are available, perfect for celebrating your honeymoon, anniversary or just for that special treat to spoil yourself. The balcony area opens onto a deck giving you direct access to the pool, while in your own private courtyard is a large Jacuzzi (hot tub) to relax in after that long day out. Internally these apartments have all the facilities and features of the 1 Bedroom Apartment. Shantara Resort does not cater for children under the age of 16.